Zenith is probably the luxury wristwatch brand that has won the most awards for each calibre it has created - chronometry awards for this calibre but also awards for the design, performance and performance of each calibre model it develops, a collection model of a luxury watchmaker it designs within its Le Locle factory. If Zenith wristwatches are luxury watches, even haute horlogerie, it is because of the manufacturing movement that drives their mechanics. Each Zenith watch model has its own movement, but there is one, a manufacture calibre, which is the authoritative one: the El Primero movement. 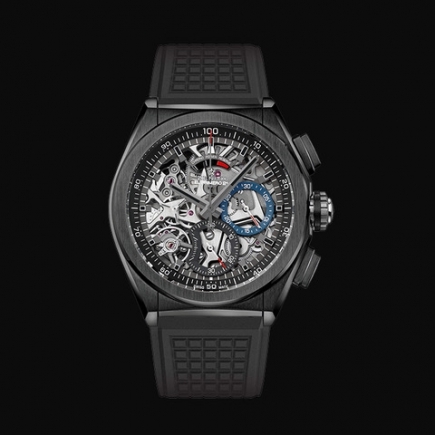 The calibre of Zenith's luxury Swiss wristwatch, the El Primero movement, is therefore an exception that must be recognised in the Le Locle brand. Since then, the Swiss manufacturer has extended the variety of the bracelet, case and dial for each model of luxury wristwatch. Accuracy and power reserve have been improved for each calibre. Steel is always used, offered in a variable diameter depending on whether the wristwatch model is intended for men, women or both. 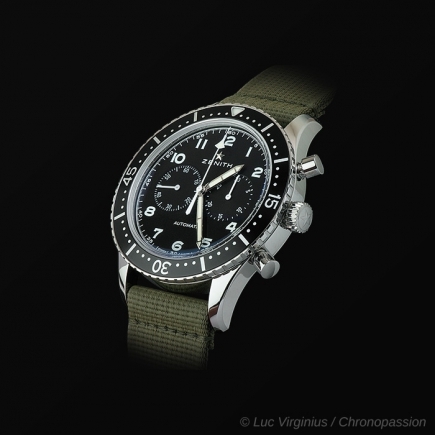 Each collection has several price and movement proposals, sometimes with very small variations in calibre, allowing the user to benefit from a chronograph, a small second, a date and a power reserve. The Chronomaster wristwatch or Elite movement model collection remains for each of them a reference for the men's or women's wristwatch, with a Swiss manufacture calibre with luxury finishes. 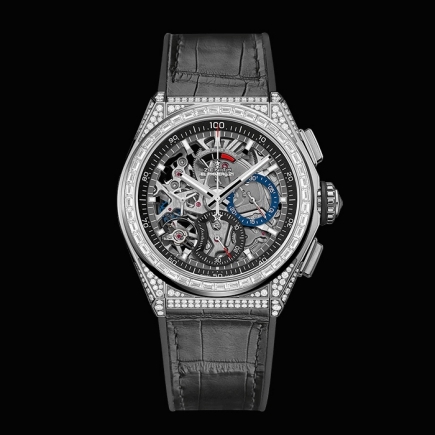 More recently, the Defy wristwatch collection has made it possible to expand the existing Zenith collection, by offering factory watches with a more elaborate case, leaving steel or pink gold to dare the titanium case, disruptive watchmaking, the tenfold precision of the El Primero calibre, already coveting first-class Swiss mechanical precision prices! The great step of precision is the Defy, the Swiss luxury wristwatch, 100% manufacture, of a new type and contemporary diameter, now occupies the forefront, alongside the Chronomaster or the Elite and their Open models. Introduced in 1969, the Zenith El Primero watch movement is a calibre capable of counting down to 1/10th of a second of its chronograph. Now in the collection, this watch movement and the wristwatch itself are now one and the same, the El Primero model. 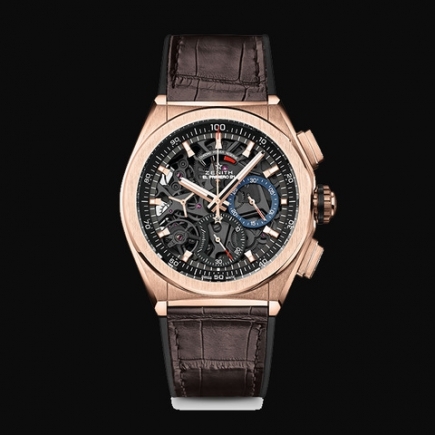 This is a unique case in watchmaking, all the more remarkable because El Primero, the model of wristwatches, has been able to be declined in different variations signed Zenith, in steel or pink gold, with always the same success, on a leather, steel or pink gold bracelet. The El Primero movement was also used by Rolex for a time - before Rolex became a manufacture and then used its own manufacture movement, a superlative Rolex chronograph that is now a reference in the world of luxury wristwatches. 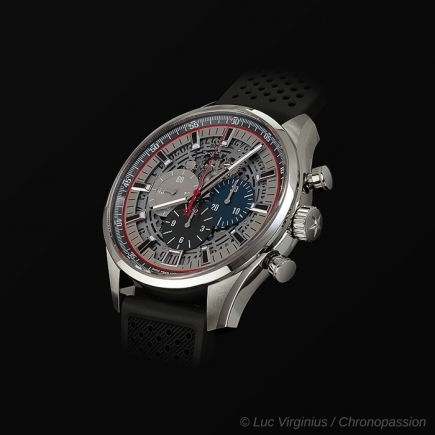 The El Primero movement is also used in other Zenith wristwatch collections, starting with the Chronomaster collection. 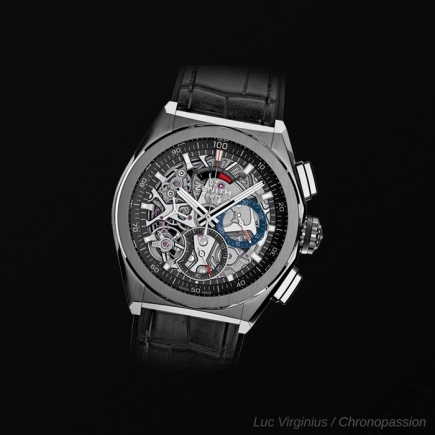 As its name suggests, the Chronomaster is a Zenith watch model equipped with a chronograph, also available in a steel or pink gold case, with a corresponding steel or pink gold bracelet, among other luxury haute horlogerie variations. The "open" version of this collection of wristwatches shows through the dial the movement beating at high speed, a feat that the manufactory maintains with an acuity that allows it to win more and more prizes. More recently, the Defy line has given Zenith and the El Primero movement a new lease of life, with the manufacture of this model being developed in line with the standards of 21st century luxury watchmaking. This El Primero calibre has thus undergone its transformation, capable of measuring 1/100th of a second in the manufactory's Defy collection. Zenith, and no longer Rolex, is the sole beneficiary. The Defy collection thus complements that of Zenith wristwatches, such as the Chronomaster or, more recently, the Pilot line, which represents for Zenith the reinterpretation of aviator watches from the past. 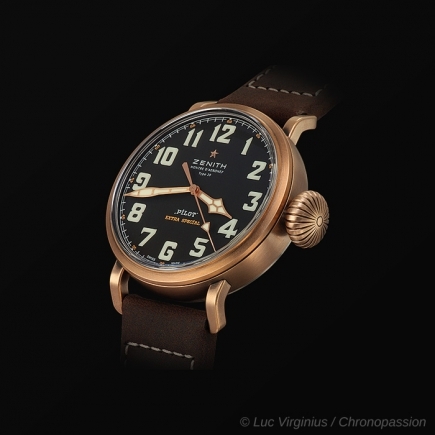 More often offered in steel as was the case at the time, the Pilot watch collection, with its large leather strap, satisfies collectors of vintage watches, at moderate prices, with a manufacturing movement and luxury finishes.